Baryons are the subatomic particles that comprise normal everyday matter. Observations of the early universe indicate that baryons make up 5% of the total mass and energy of the universe. A detailed census of baryonic matter in the local environment does not match with this observation. Around a third of the baryonic matter is missing and purported to be in the form of hot diffuse gas. HaloSat is a 6U cube satellite dedicated to making observations of the hot halo of the Milky Way galaxy in an attempt to understand the baryonic content in galactic halos. Understanding the large hot halo of the Milky Way requires an all-sky survey of the diffuse background. As such, a dedicated instrument is required to make the observations necessary. 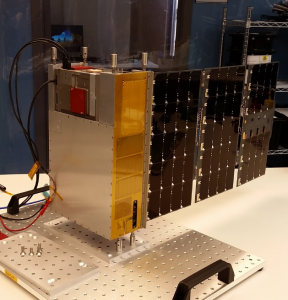 The HaloSat cube satellite is just that instrument. By probing the soft X-Ray diffuse background of the Milky Way over the entire sky, we aim to extrapolate the mass and geometry of baryonic content in our hot halo. This will also provide a useful metric for measurements of halo contents in other galaxies. HaloSat has three soft X-Ray detectors that we will use to observe the Oxygen VII (561 eV) and Oxygen VIII (653 eV) photons in the diffuse background. These transition lines act as a tracer of the diffuse gas due to the gas temperature and the ionization of lower z elements. Using appropriate abundances, we can interpolate the amount of total baryonic content based upon the amount of Oxygen observed. There are two prevalent theories for where the missing baryons are likely to be located. The hot halos of galaxies, and the large swaths of material in tendrils between galaxies. In the fall of 2017, studies using the Sunyaev-Zeldovich effect to probe the density of strands of Warm-Hot Intergalactic Medium (WHIM) claim to have found enough matter to account for the missing baryons (Tanimura et al. 2017; Graaff et al. 2017). Likewise, a study in 2012 claims that the baryonic content in the circumgalactic medium (CGM) of the warm-hot halos accounts for the missing baryons (Gupta et al. 2012). Understanding the content of galactic halos may help to support or constrain these measurements.